This post is just a short digression from my experimentation with Premo Mica clays. Last time I was in Hobby Lobby I noticed Pardo’s new “Art Clay” line: 14 basic colors in 2 oz. blocks instead of those ridiculous little balls they first distributed. (Note: I put “Art Clay” in quotes because I think the name should be changed; it is too easily confused with Metal Art Clay.) Last Thursday I received samples of all the colors to experiment with. Of course the first thing I did was mix colors. Before I comment on the colors, though, I want to comment on the clay itself. I was pleasantly surprised by the ease with which the clay went through the pasta machine right out of the package. There was no stickiness and no crumbling. It didn’t gunk up the pasta machine and all of the colors I tried were all of the same consistency. I must point out that the samples I tried came straight from the factory so they weren’t exposed to the variety of conditions that occur when clay is shipped to distributors, then stored for a while, then shipped to retail stores where it can sit on the shelf for some time, so I tested it under optimum circumstances. However, if the clay in local stores is like the clay I received from the factory, the other brands may get a run for their money on the basis of consistency alone. The colors I tested mix beautifully. I have not fired the clay yet so my comments on color apply only to the unfired clay. I don’t know yet how much the colors change when the clay is fired. The color selection is similar to Premo primaries without zinc yellow. Pardo’s “cyan” is comparable to Premo’s cobalt blue and is available in stores, not just over the internet. That’s a big plus. The greens mixed from the Pardo yellow were somewhat muddy, similar to the greens mixed from Premo cadmium yellow. I mixed the Pardo cyan with Premo zinc yellow to see if the addition of zinc yellow to the Pardo line would solve that problem; it would. It seemed to me that the Pardo ultramarine would be improved by having less pigment in it. In that case, it wouldn’t be necessary to add so much yellow to it when mixing greens, or red when mixing purples. Of course there are a lot of other important characteristics that must be evaluated to determine the clay’s overall suitability for a particular use. I just looked at consistency and color. I’m pleased enough with the results that I’m ready to proceed with other tests. If the colors had been less satisfactory I wouldn’t have bothered with the rest. I’m anxious to learn about other people’s experiences with this clay. This entry was posted in Color, color mixing, Pardo Clay and tagged Carol Simmons, Color, Color Mixing, Kaleidoscope Canes, polymer clay, Polymer Clay Classes, Polymer Clay Colorado, Polymer Clay Teachers, Polymer Clay Techniques, Polymer Clay Workshops. Bookmark the permalink. I haven’t tried Pardo yet, though I think Lee Ann has. Looking forward to your further experiments. I’ve used Pardo for awhile. I, too, find it to be pliable and ready to roll through the pasta machine. I’ve been happy with everything about it except the price. I especially like the translucent, it seems much more transparent than even Frost. If the price was competitive, I think I would be a convert, but for now I’ll stick to Premo and Fimo which I can catch on sale. I’ve had good experience with the “artClay” – the orginal pardo is too soft. But again unless the price goes down, I will be sticking with Premo. 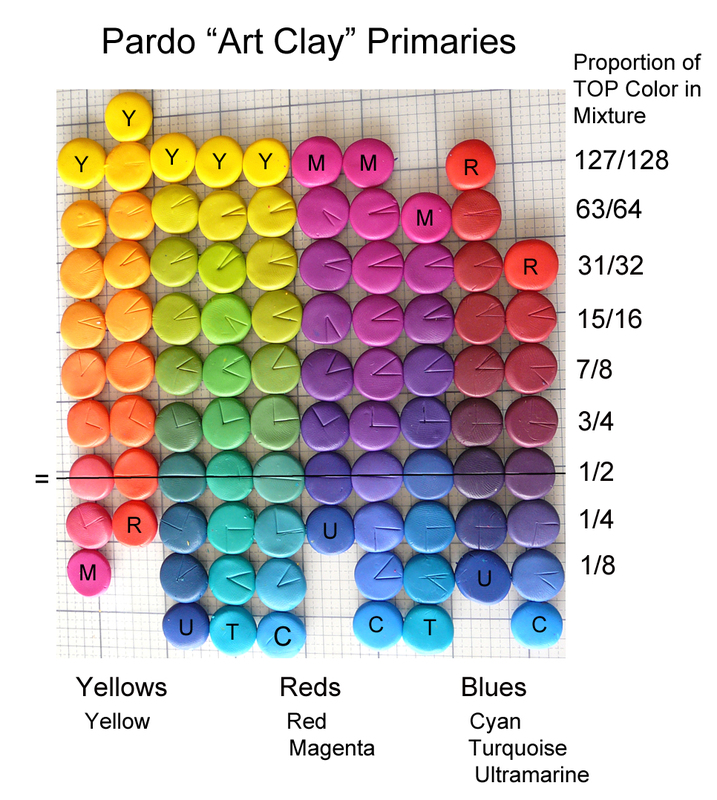 Sorry, I must add….I’ve only used the Pardo Jewelry Clay, not the Art Clay. Like you, my first impressions of Pardo Art clay are favourable, although I haven’t used it much yet. I fired some chips from the packet colours at the recommended temperature for 40 min and found very little colour shift. I just thought the yellow and green warmed and darkened very slightly. I am really interested to know what you find. It is not widely stocked in the UK, and still works out expensive here, but I thought it seemed very interesting. Penny Vingoe of Clayaround has been trying to collect info about what people have done with Pardo art Clay on http://www.pardopeople.co.uk/ – but I see she already has a link to this blog! one of the best things about Pardo Art Clay is that is does NOT change color during hardening (I hate to find a pattern almost “vanished” after curing). So that was one of the things we expected Viva Decor to develop during our collaboration. One other thing was our aim to have (as much as possible) primary colors to get beautiful mixtures … yes … a zinc yellow would be nice. Thank you, Ulrike. I’m baking today so I’ll get to see for myself. I have played with Pardo too and find that it really is great for taking impressions from a mold. It is pliable enough to push in and it holds the details nicely. I tried it because I had never heard of it before. Thank you for steering me to your blog. Actually…you’ve inspired me to give Pardo a try. I realize, that straight colors right out of the package appear darker when baked, than when a tiny bit of white is added for the true color to show though. The palette, looks bright and pleasing. I’m curious to work and feel the clay in my hands….Premo needs so much leaching now. However, It would be nice if the price does come down, so it’s more feasible to work with. Does Pardo offer any metallics? The old Pardo Jewelry clay had lots of metallics; so far the new Art Clay doesn’t. I assume (hope) they will be coming. Thank You! A better name for sure. Thank you for the class Intricate Kaleidoscope Cane Veneers (2-day workshop) in Iceland. I enjoy it very much. My own design idea have taken great steps forward. Thank you so much. Hello Katrin, You are quite welcome. I loved the Iceland group and will be in touch via email soon. I realize I am late to the party. I have tried every clay available in the U.S. Right now I am using premo, fimo pro and kato. None of them are as firm as I would like. I wish fimo did not get rid of classic fimo. The replacement, Fimo pro, gets crumbly if old, but isn’t as firm as classic after conditioning. The original Kato was firm but if it got old, you could forget ever using it because it became a rock. The new kato isn’t that firm in my opinion. Premo is reliable but the white is mushy and other colors can be as well. Leaching never works for me. The clay ends up crumbly and after conditioning, it gets soft again. I think I may have to return to Pardo, even though it’s pricier and harder to come by in the U.S.